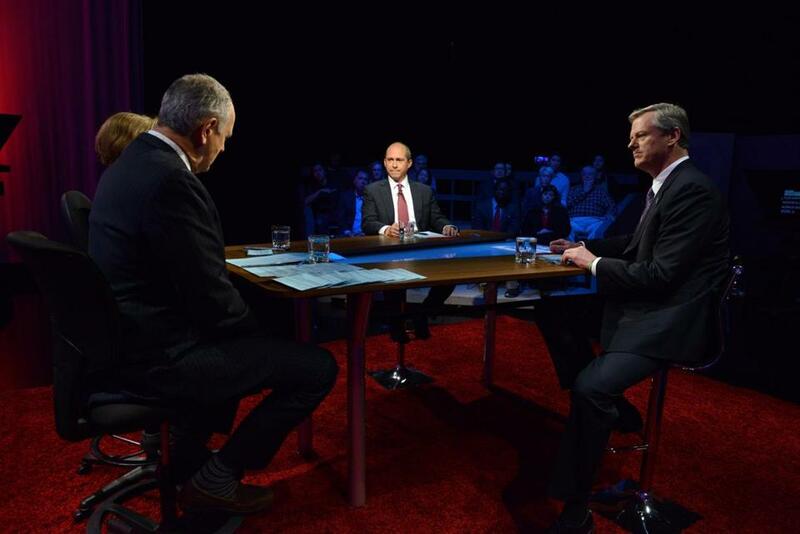 Massachusetts Republican Governor Charlie Baker (right) and Democratic nominee Jay Gonzalez (center) squared off in the second 2018 Massachusetts Gubernatorial debate at the WGBH Studios in Brighton. 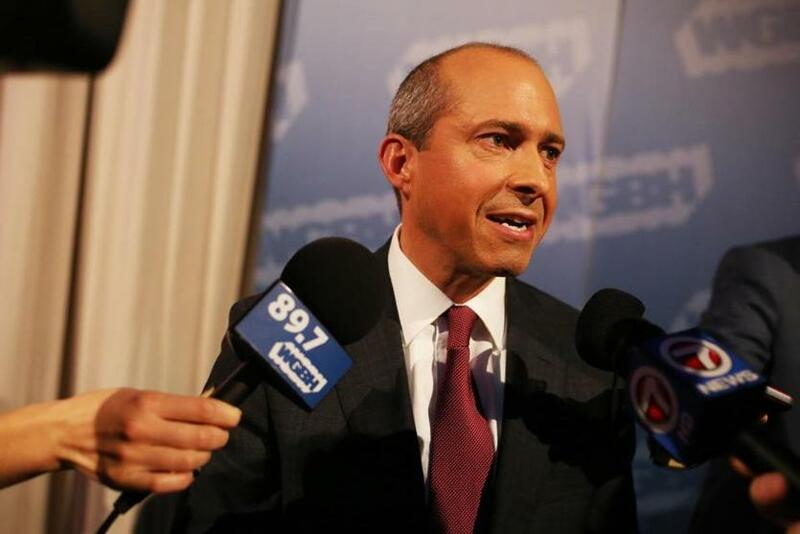 Democrat Jay Gonzalez put Charlie Baker on the ropes Wednesday, pressing the Republican governor in a televised debate to decide between bucking his party or backing a federal candidate who opposes abortion rights and supports President Trump. Gonzalez, trailing in the polls, asked Baker directly whether he would vote for Geoff Diehl, the Republican nominee for US Senate, who is running against Elizabeth Warren and is part of the GOP ticket Baker has endorsed. The query prompted a potentially damaging bout of indecisiveness from the state’s chief executive on live television, where he wavered and wobbled over several questions on Diehl — only committing to vote for him after the broadcast ended. Initially, however, Baker, who supports abortion rights and has said he didn’t vote for Trump, met Gonzalez’s question with silence. “Governor?” prompted co-moderator Jim Braude during the live event at WGBH-TV studios in Brighton. “You don’t know if you’re going to vote for the guy you endorsed?” Braude asked. “I haven’t made a decision,” the governor replied. “But you may not vote for the ticket?” Braude pushed again. Baker said he would make his decision “eventually” and would make sure people know. Eventually turned out to be a few minutes later, when Baker told reporters at WGBH studios after the debate that “in the back and forth” he misspoke and will vote for Diehl. The exchange about Diehl was the most evocative of the debate and took place on fertile political ground for Gonzalez. He has tried previously, without much apparent success, to tie Baker to Trump, who is seen unfavorably by a big majority of likely voters in Massachusetts. But Wednesday, Gonzalez pushed Baker to say he will vote for Diehl, who cochaired Trump’s 2016 presidential campaign in Massachusetts and has positioned himself as a Trump-style conservative. After the hourlong forum, Gonzalez worked to twist the dagger. During the debate, Gonzalez also latched onto simmering scandals at the Massachusetts State Police, including revelations last week it had sought to destroy years of audit and payroll records. Baker called the attempt a “mistake.” (No records were ultimately destroyed, the State Police said.) But the governor staunchly defended his handpicked colonel, Kerry A. Gilpin. He said he didn’t believe she knew about it, and argued that the records weren’t part of an investigation into dozens of troopers who’ve been targeted in an overtime fraud scandal. “What you were just talking about was an attempted coverup,” Gonzalez charged, saying the records were “relevant” to the allegations. He also reiterated his call for Baker to fire Gilpin. “We need someone with credibility from the outside and who doesn’t come from this culture of corruption,” Gonzalez said. Baker, while acknowledging struggles at the agency, offered a robust defense of the broader force. “To paint a brush across 2,000 men and women — who, every single day, serve the Commonwealth and serve the people of Massachusetts, and support gang units and fugitive units, and do a lot of the really important grunt law enforcement work that needs to be done here in the Commonwealth — I think is unfair,” he said. Baker, too, went on offense, accusing Gonzalez of floating pie-in-the-sky expensive plans for health care, transportation, education, and other items without adequate plans to pay for them. Moderator Margery Eagan also asked Baker for an update into an investigation into his son, Andrew “A.J.” Baker, who was accused of groping a woman on a Boston-bound JetBlue flight in late June. Baker, 24, was not arrested at the time, and the governor said after the allegations became public that the US attorney’s office was reviewing the case. Pressed Wednesday for more information, the governor demurred, saying he has not spoken to federal prosecutors. The US attorney’s office has not publicly commented on the allegations and would not say last month whether it is still pursuing an investigation. “My son’s a private citizen, and I said it should be investigated,” Baker said. The forum featured several other topics, from traffic woes to climate change and energy, with the candidates, both former state budget chiefs, sometimes diving deep into the weeds. Baker and Gonzalez are scheduled to meet in their final TV debate Nov. 1. in an event hosted by a consortium including the Globe, WBUR-FM, WCVB-TV, and others. Jay Gonzalez spoke after the debate. The debate was the second in the governor’s race, with a third and last forum set for Nov. 1. 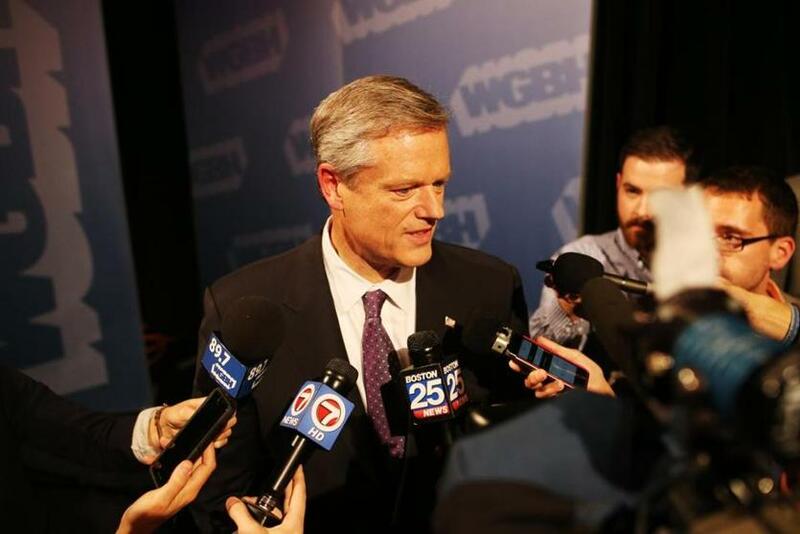 Baker spoke after Wednesday’s debate in Boston. Reach Joshua Miller at joshua.miller@globe.com. Reach Matt Stout at matt.stout@globe.com.